Inside the main room of Gallery 825, L.A.-based artist Diane Williams wants you to experience her work without walls. In her solo exhibition titled INcongruence, eight woven banners hang from the ceiling, a levitation act accomplished through imperceptible clear wire. 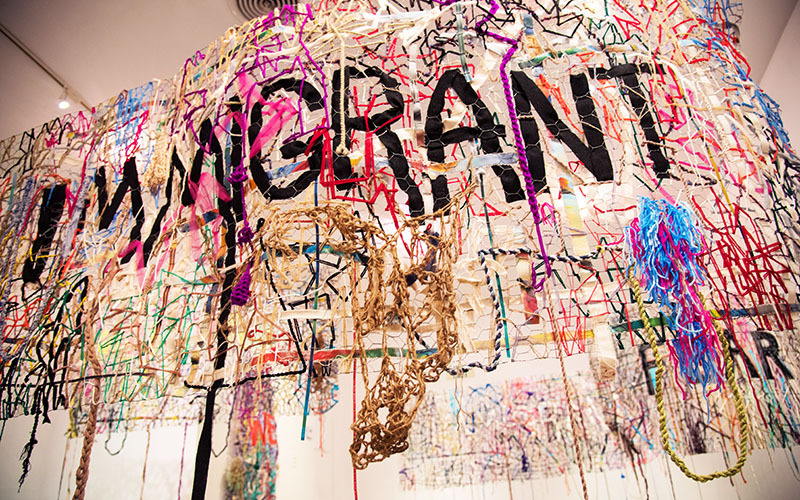 Each piece is a chaotic amalgamation of colors and textures, with a single word boldly woven in the center: “Immigrant,” “Fear,” “We,” or “Migrant.” Inspired by recent rallies and demonstrations, the pieces function as conceptual protest signs. Yet unlike the signs you’ll find in the streets, Williams’s pieces don’t explicitly declare an opinion or statement. Instead, she urges viewers to examine their own emotional responses to the singular woven words. “I don’t want to hit people on the head. I want to make people think about the work on their own,” says Williams, who came to the U.S. from the Philippines when she was 14. The floating banners consist of a wire frame adorned with recycled and thrifted materials—yarn, thread, shredded paintings, and various fabrics sourced from Santee Alley and Eastside thrift shops. She searched for “lived-in” materials, eschewing store-bought items in favor of anything carrying personal history. The result is a colorful, yet cohesive ragbag that’s symbolic of the cultural diversity in today’s society. Seemingly incongruent pieces come together to form a unified whole, a visual representation that contrasts and differences can coexist harmoniously. We spoke with Williams about the making of INcongruence and how she channels her personal immigrant experience through art. How did the idea for INcongruence come about? The work was inspired by protest signs we often see on Los Angeles freeways and roadside memorials decorated by people grieving for someone they’ve lost. These sights are fascinating to me, and I often wonder how others perceive them. I assume most people just look and move on and maybe some won’t even pay attention. But we know they were placed there for personal and impassioned reasons. I love how you stylized the title, INcongruence. Can you explain your decision to use this title? The modular weavings I created for the show include text so I wanted to play with the title. We live in a more nuanced society where things aren’t always black and white. The definition of incongruence is not compatible, not the same or out of place. If I played with the lettering, the meaning can be perceived in different ways. Generating another perspective is what I attempt to accomplish with the work. Your art often deals with questioning assumptions and norms. What topics and assumptions specifically do you hope to challenge with INcongruence? My work deals with sociopolitical concerns surrounding gender disparities and xenophobia. These issues are about my identity as an immigrant and as a woman of color. The word immigrant has had a negative connotation in our society. This year, the United States Citizen and Immigration Services took the words “nation of immigrants” out of its mission statement. What role do you think art plays in our current cultural and political landscape? Art can influence people’s perceptions. It challenges our way of thinking by starting a dialogue. These conversations are uncomfortable as our current political climate is so nuanced but it’s important to have them in a non-threatening way. The political movements have raised a lot of these important questions recently but art preserves historical context in a way that fact-based history cannot. Art captures the sentiment and the collective response of the times. It pushes the conversation without being overtly didactic and judgmental. In my work, I want the viewers to formulate their own thoughts and feelings about the art. How has the city of L.A. shaped your perspective—both as an artist and overall? I live and work in the northeast side of Los Angeles where there is a big concentration of immigrants. This influences my art as I’m always drawn to the social landscape around me. Xenophobia is fueled by fear of the “other.” Although we seem to be divided as a nation, Los Angeles, the “melting pot” of all culture, is a testament to living harmoniously with other people who don’t look the same as we do. We work and live side by side and with interactions, we find some commonality. Understanding this commonality we share and acknowledging our cultural differences with empathy and appreciation can make this world more equitable. Diversity is what makes this country great. My influences come from a stew of sources: Freud, Jungian archetypes, magic realism, surrealism, Paula Rego, Shirin Neshat, Kiki Smith, Marisol Escobar, Thomas Hirschhorn, Joseph Beuys, and many others. Describe your creative process. You often deal with very personal and particularly complex topics in your work—how do you translate your personal feelings and these political ideas and themes into your art? It’s important that I don’t let the negative aspects of dealing with these complex issues affect me in a non-productive way. There is constant experimentation and research either in theory and materiality in what I’m creating. It doesn’t always work and my artist friends are the ones to point this out, then I move on to the next with their critiques in mind. To me, art is about discovery and experimentation. There has to be joy in the art-making process. What do you hope to leave people with after viewing INcongruence? Although INcongruence is about my own identity as an immigrant, many people resonate with this subject. The ones who don’t, I very much intend to include in these conversations because we’re all a part of this society. In this contentious political climate, it is important to have these exchanges in a safe and non-didactic environment. I make the work and the viewers can form their own opinions.